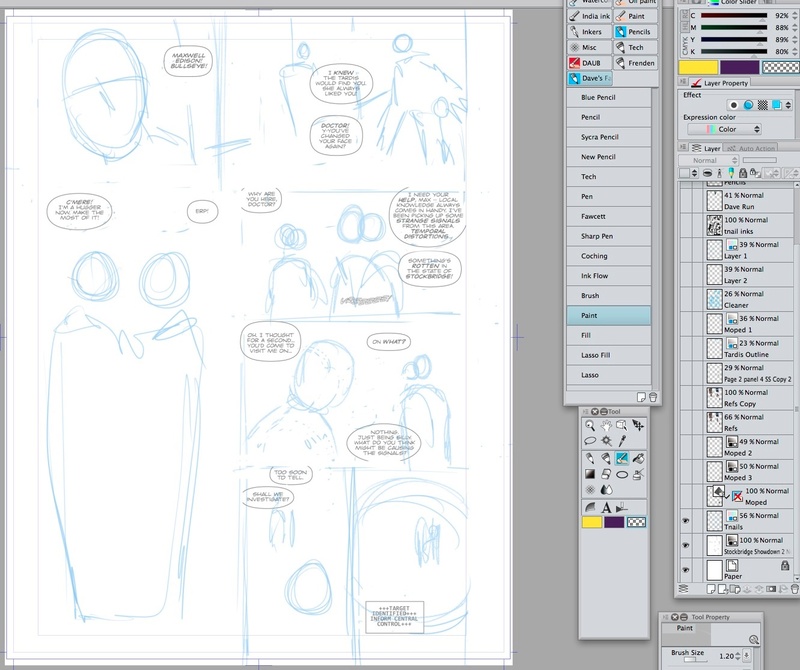 First step is creating a rough layout, based on a thumbnail sketch. I've dropped in the balloon lettering at this point, since the text is fairly heavy, to make sure I have room for the drawing to breathe in each panel. Next step is the rough pencils which are not complete. The likeness of Peter Capaldi is only roughly indicated, since I like to draw all the likenesses in one pass, to keep them fresh in my head. 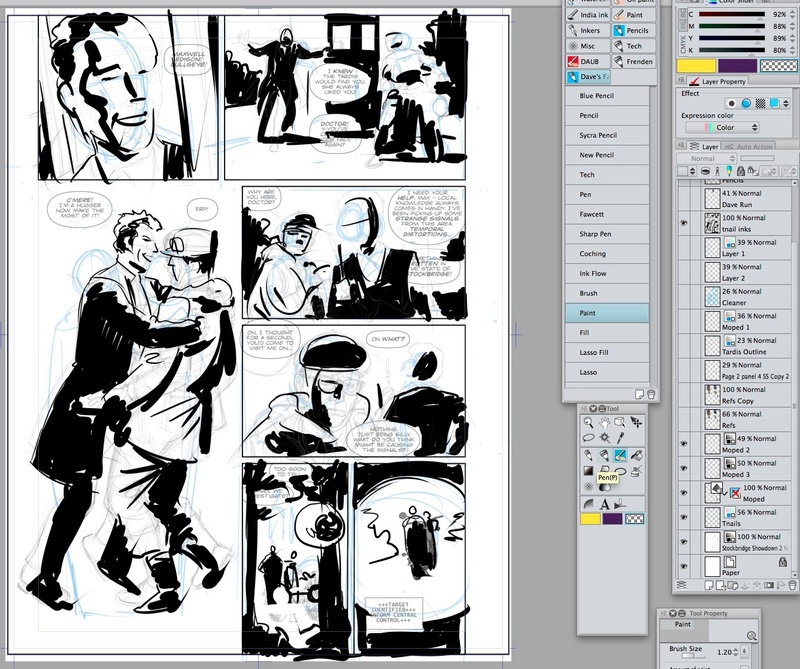 The screenshot above shows the areas of solid black roughly scribbled in on a separate layer to give me an idea of how the final page composition will look in terms of black and white. Nest step, the references. 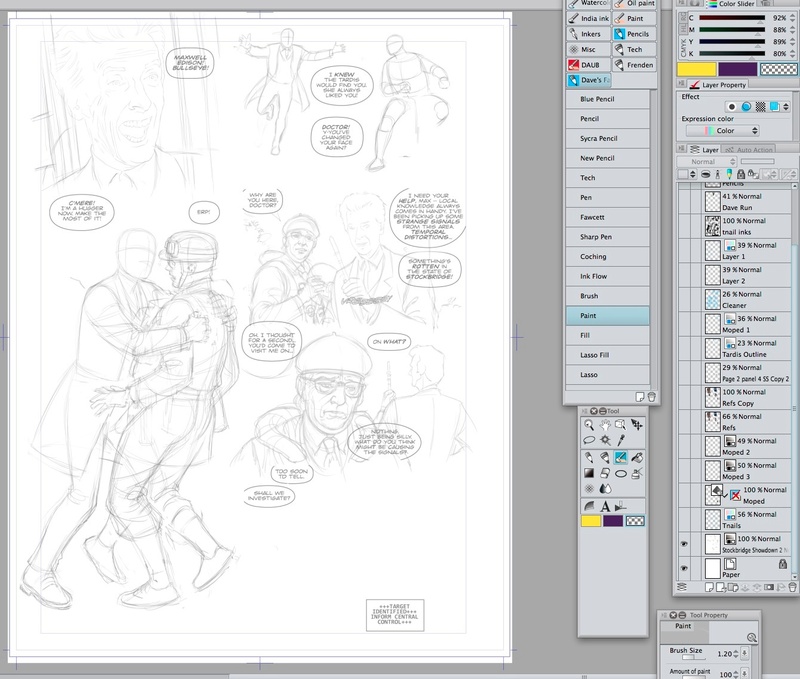 This screenshot shows reference elements dropped in over the top of the rough pencils, scaled and adjusted to fit my drawing. It's important to do it this way, rather than make the drawing fit the references, as this will stultify creativity to some extent. Note: I've also imported a 3-D model of a moped and rotated and scaled it to fit my drawing. 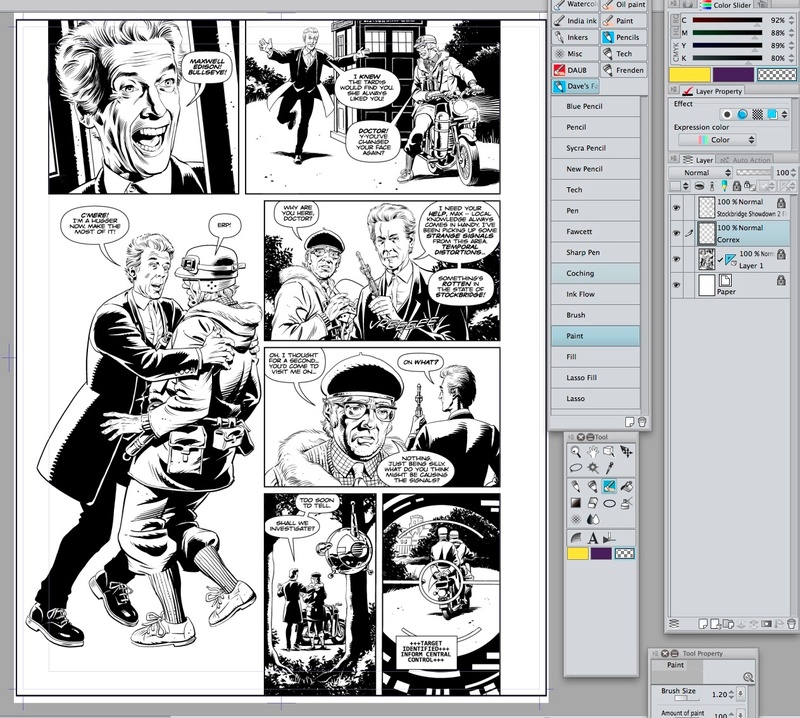 I've also used a picture of myself taken with my computer's webcam as reference for the running figure in the second panel. 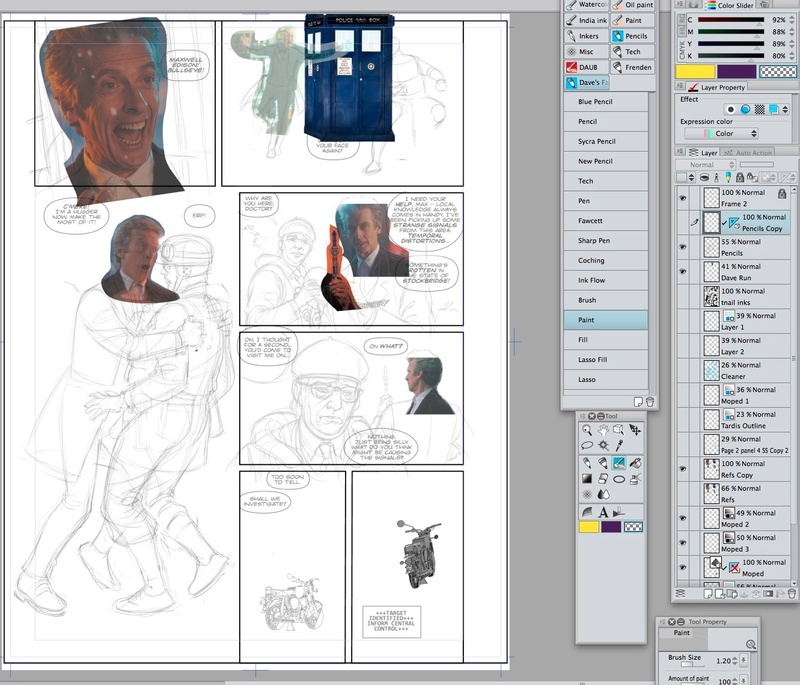 Lastly, it comes down to the final inks. I've used a variety of inking tools here, including straight line and elliptical rulers for the mechanical elements. I also used a custom Leaf Brush to draw the background foliage using both black and transparent inks. I've created my own Sub Tool palette so that I can easily access my favorite tools, another great advantage of CLIP STUDIO PAINT. Be sure to check out Part I and Part II of Dave's blog series to learn more about his creative process.